Visakhapatnam District MPEO Jobs Notification - Multi Purpose Extension Officer Posts Online Apply : Visakhapatnam District Agriculture Department Permission for MPEO Jobs contracting the service of 12 Multi Purpose Extension Officer Horticulture Dept. Visakhapatnam District MPEO Posts Recruitment guidelines and Educational Qualification. Horticulture MPEO 12 Posts Vacancies list at www.hortivisakha.apcfss.in. విశాఖ‌ప‌ట్నం జిల్లా ఉద్యాన శాఖ ఒప్పంద ప్రాతిప‌దిక‌న‌ బ‌హుళ ప్ర‌యోజ‌నఉద్యాన విస్త‌ర‌ణాధికారి పోస్టుల భ‌ర్తీకి ద‌ర‌ఖాస్తులు కోరుతోంది. Salary: Rs. 12,000 / - per month and Incentive from 1,000 to 3,000. 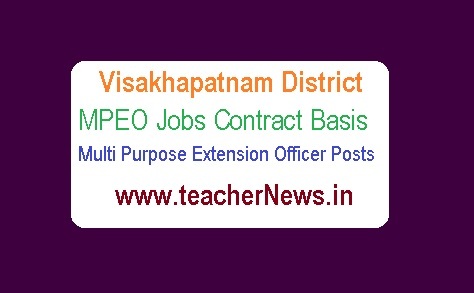 Visakhapatnam District MPEO Jobs Notification - Multi Purpose Extension Officer Posts Online Apply link at hortivisakha.apcfss.in.Cizag MPEO Posts Vacancies, Educational Qualifications, Selection Process Download.